The redesigned base G class will arrive at dealerships this fall. DETROIT — After the most thorough redesign in its 39-year history, the Mercedes-Benz G class is poised to sell out in Canada and post record U.S. sales in 2019, the automaker says. Helping to push the brawny SUV to new heights will be new versions of the popular AMG high-performance variants of the G class, Mercedes-Benz USA CEO Dietmar Exler said. Product developers also will look to expand the G-class lineup beyond its core models. “We will be curious and test the waters for special editions,” Exler said this month at the Detroit auto show. The AGM version will not immediately be available at launch in Canada, but will arrive a few months later, Caza said. Mercedes chose the Detroit show to unveil the redesigned version of its base G class for the U.S. — the 2019 G550 model with a carryover 4.0-litre, turbocharged V-8 engine. It will arrive at U.S. dealerships this fall. Pricing has not yet been announced, but a “slight price increase” is likely, Exler said. There will also be a price increase in Canada. AMG variants will be introduced soon. The automaker has also sold AMG G63 and G65 variants of the G class in the U.S. The AMG variants will be available as part of the 2019 model year, James confirmed. 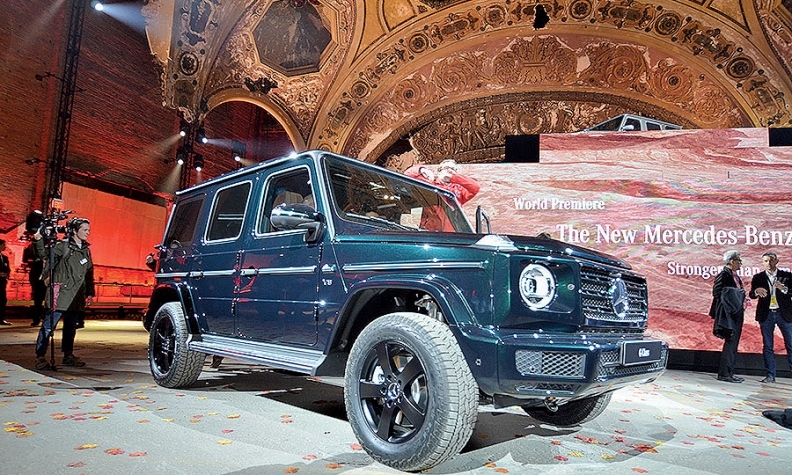 Mercedes is expected to show at least one, likely the G63, in March at the Geneva auto show. AMG models make up the majority of the nameplate’s U.S. sales. Mercedes sold 4,188 G classes in the U.S. in 2017, up six per cent from a year earlier and the first time the G class broke the 4,000-vehicle annual threshold since its U.S. introduction in 2001. With the changeover to the redesigned version happening this year, another sales increase in 2018 is a “maybe,” Exler said. But a “nice increase” is a pretty good bet for 2019.